Shifting our girls’ understanding of how financial systems work could help break the endless cycle of poverty they live in. 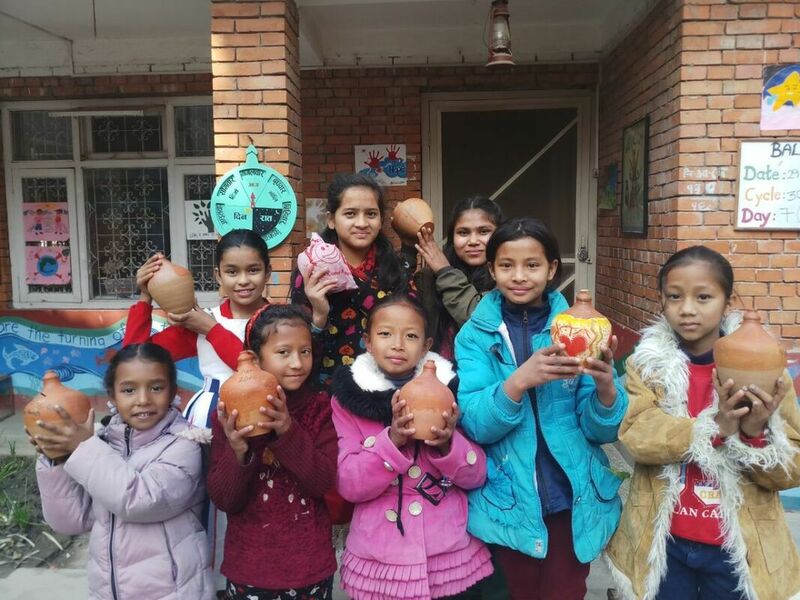 In August, 2018, our Nepal staff gave piggy banks to girls at the Bijeswori School and encouraged them to save. The first Piggy Bank Project was so rewarding, we decided to expand it. Each and every HIO girl will now receive piggy banks of her own. Many girls decorated the first piggy bank pots with brightly colored designs. They thought of creative ways to fill them up. For six months, they squirreled away rupees—everything from extra pocket change to money they’d earned doing odd jobs. In January 2019, 20 wide-eyed and eager HIO girls ceremoniously broke open their piggy bank pots and counted up their treasures. What a delightful moment! Rewarding the girls’ heartfelt efforts will further encourage their savings. We’ll give a modest cash award to each girl bringing a piggy bank pot she’s filled up herself back to school. Some of our girls’ mothers cleverly thought of a way to apply newfound skills they’ve learned in our women’s literacy program. They offered to set up a co-operative bank account to help children see their savings grow. How encouraging that the practical lessons we teach are helping HIO mothers and their girls rewrite their script for success. Teaching our girls early on to exercise control over their own money is a wonderful way to empower them. For $500 per program, we can encourage our girls to develop savings habits that promote financial security in the future. Your donation helps purchase 160 piggy banks and contributes to festive celebrations that recognize our girls’ efforts. Piggy bank pots are distributed and opened twice—once in April at the start of the school year and again in October for the Dashain holiday. HIO girls from the Bijeswori School were given piggy banks to encourage their savings. Devika took extra care of her bank, lovingly painting it to make it feel special. She saved bits of her own pocket money and earned extra rupees by cutting threads off of jackets her auntie brought home from a factory.